Today's Samsung event in New York City was a strange scene -- the company collected Galaxy Tabs from the journalists in attendance and handed back coat check receipts, promising to give the devices back after the press conference ended. One Samsung executive acknowledged the unusual nature of the event, explaining that, "this is the first time we've held a news conference for a software update, and it probably won't be the last." The event marked the pre-launch of a major software update for Samsung's slate -- one that is set to get wide release on August 5th. Members of the press, however, were given a side-loaded preview of the tablet UI -- as were New York City Galaxy Tab 10.1 owners who showed up to the Samsung store with tablet in-hand. We've been playing around with the update for a bit and have a full hands-on preview for you after the break. The TouchWiz UX updates are clear from the outset. The Live Panel view is all about widgets -- big, colorful widgets. Samsung refers to the view as "magazine-like," a clear statement for a device looking to fill in the hole left by rapidly closing paper periodicals. The home screen defaults to big windows featuring the time, weather, and an image of your choosing. Clicking the time will bring up a control panel that lets you adjust the clock and set an alarm for yourself. The weather panel links to a full page of information including the week's weather, a weather map, and the ability to switch location. The image, meanwhile, is linked to the device's picture gallery, where it's possible to switch up your default image. 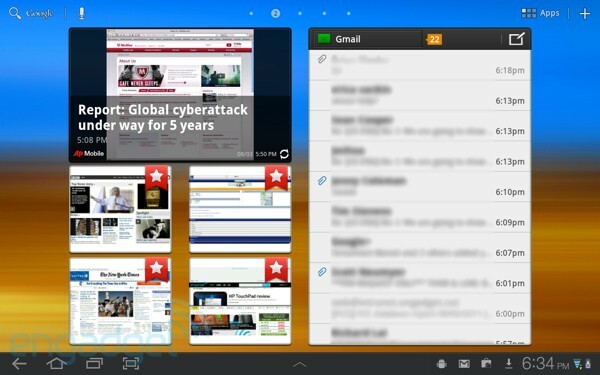 Swiping right will bring up a large rotating visual newsfeed on the left, offering up headlines laid over news images. Below this are two rows of customizable bookmarks. To the right is a shot of your email inbox. The panel can either default to your Gmail account or another service, once you've entered all of the relevant info. The email widget offers two lines for each email -- a name and a subject. Clicking a line will open up that message in the mail app. Swipe to the left and you'll see your Social Hub, which aggregates updates from various social networks into a single feed. You can add feeds from Facebook, Twitter, and LinkedIn, as well as messages from Exchange and the default e-mail app. These feed can be viewed a single social network at a time or with all of the entries populating a single stream. You can also add updates, favorite posts, or share information via email through the app. To the left of the social hub is a scrollable calendar featuring today's events, a Yahoo finance widget, and your manually entered top contacts. Of course, all of these default widgets are fully customizable. You add and delete as you see fit, just so long as you don't run out of space. Customization occurs by clicking a plus button in the upper right hand of the screen, which brings you to a page featuring Widgets, App Shortcuts, Wallpapers, and More. Clicking a widget will add it to the desktop. Additional widget options include the always handy Advanced Task Killer, Amazon MP3, an analog clock, Google Books, Google Search, Android Market, and YouTube. When you need to remove an app from the screen, simply hold down on it and drag it into the trash can icon that appears in the upper righthand corner of the screen. The new UI also features a Mini Mode Tray, which can be accessed by tapping a small Up arrow in the middle of the taskbar on the bottom of the screen. Hitting this will pop up "commonly used" applications," including the Task Manager, Calendar, World Clock, Pen Memo (a simple text input application that uses your finger or typing functionality), Calculator, and Music Player. Clicking the right side of the bottom taskbar will bring up a panel that features some basic settings, including WiFi, brightness, and access to your calendar reminders, most recent email message, and additional settings. The upgrade adds a basic photo editor to the mix, which lets you rotate, resize, crop, adjust colors, and add a few effects (including Blur, Motion, Filter, and Frames). It's certainly not a comprehensive feature set, but the app is actually pretty full for a free tablet photo editor -- akin to the feature sets available in most browser-based editors. The device's copy and paste functionality has been extended as well, now including images and links, which can be shared via social network or email. The virtual keyboard can now be resized and dragged across the screen. Swype functionality can be enabled by clicking the keyboard icon at the bottom of the screen, as well. The software comes bundled with Samsung Music Hub, the company's 7digital-powered version of iTunes, which gives you access to millions of downloadable tracks, which appear to be mostly priced at between $0.99 to $1.49 a pop. It's a pretty straightforward application that ought prove familiar to anyone who has spent any time shopping in an online music store -- one that competes directly with the pre-loaded Amazon MP3 app. Media Hub, meanwhile, is an extremely slick entertainment app that gives users access to downloadable video from NBCUniversal, Paramount, Warner Bros., Fox, CBS, and MTV. The selections include movies and next day TV shows. When opened, the app defaults to a scrollable gallery of new content -- the box shot in the center of the screen offers up an abstract for that selection. You can filter content by movies or TV, or you can simply search for a title by clicking the magnifying glass on the top of the screen. Once an account is created for Media Hub, it can be associated with up to five devices, so your content isn't tied to one machine. It's a pretty solid app that's all the more welcome with the arrival of the Galaxy Tab 10.1's newly announced HDMI adapter. And while the Galaxy Tab is certainly no Cisco Cius tablet, Samsung is stepping up the enterprise functionality on the thing, as well. Upgrades on that front include Cisco VPN and WebEx, device encryption, and Exchange ActiveSynch version 14 support. In all, there are a lot of solid additions here that certainly warrant an upgrade for TouchWiz users when the update rolls out to the public on the 5th. Of course, there's an important caveat here -- non-TouchWiz users have a lot less to be excited about. While Samsung isn't requiring users to accept the skin on their devices, declining it will block you from future OS upgrades -- i.e., no Ice Cream Sandwich for you if you don't buy into the world of TouchWiz. It's an irritating decision on Samsung's part, particularly given the fact that Galaxy Tab 10.1 units initially came loaded with the standard Android interface, but it's practically par for the course at this point.